Very nice Sandra, is this your new Acer. They are susceptible to wind burn, arent they. This one is lovely. looks perfect. Im sure it will Sandra. Looks like the red one is a bit hardier. Do you know the variety of this one. I love that it looks really really nice and neat ! Liking it, liking it a lot.......Actually, I love it!! What are the ones with the 2 tone colours? Are they the busy lizzies then? Not seen them like that down this way!! 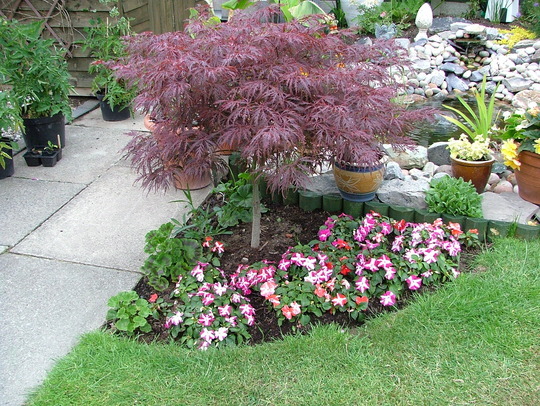 fab picture of your acer and surrounding planting,have a potted palmatum,about to transplant to bigger pot,about ten years old now.our favorite plant. repotted today,ericacious soil recommended.bought largest pot available! !have also moved to a shaded corner away from the wind and direct sunlight.